We are getting ready for a snow storm which we don't really do here in Seattle, but it put me in mind of sweaters. 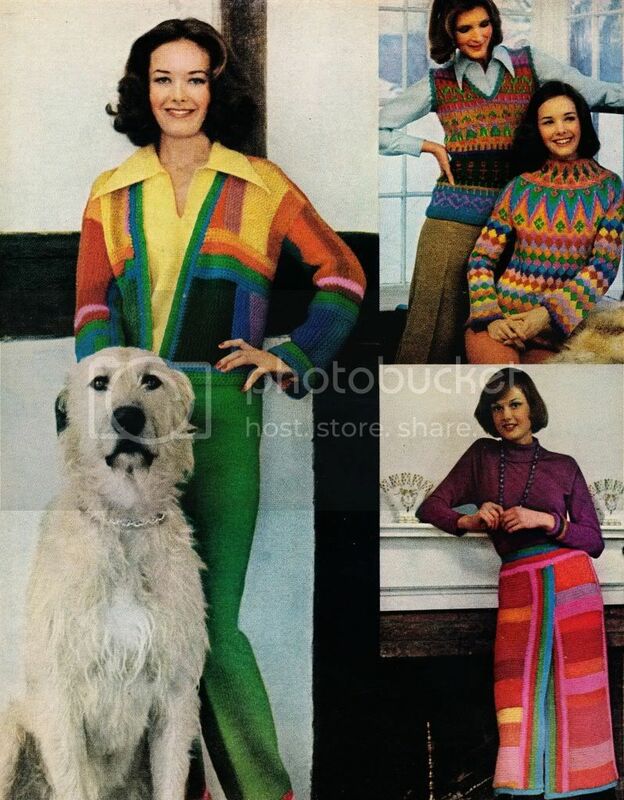 Then I found these hippy chick knits for you to make. Knitted patchworks play a visual game on a color-sliced cardigan that rides atop a pair of matching pants. Garter stitch strips knit in varying colors are joined with strips of crochet. Pants, knit in the round, have a drawstring waist, crocheted trim at bottom. Coats & Clark's Red Heart Knitting Worsted. 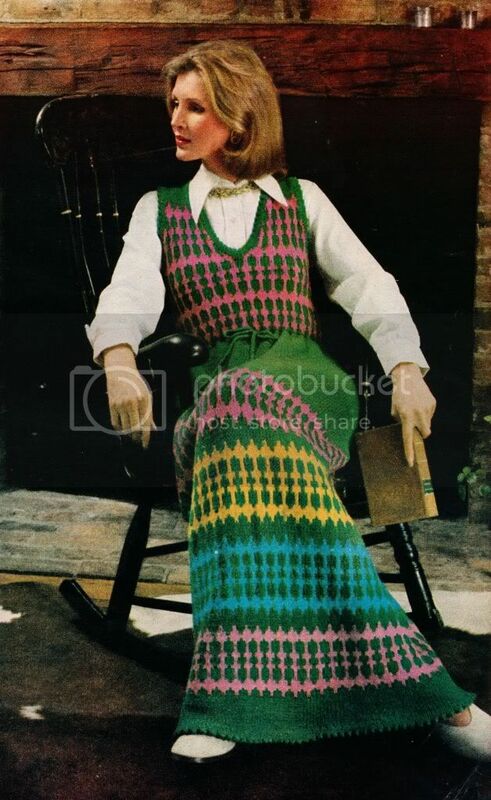 Multipatterned vest is knit in one piece. Patterns are traditional Scandinavian designs-hearts, flowers, roosters, and little people. Coats & Clark's Knitting Worsted. Yoked pullover, a mosaic delight, is worked in the round to underarms. 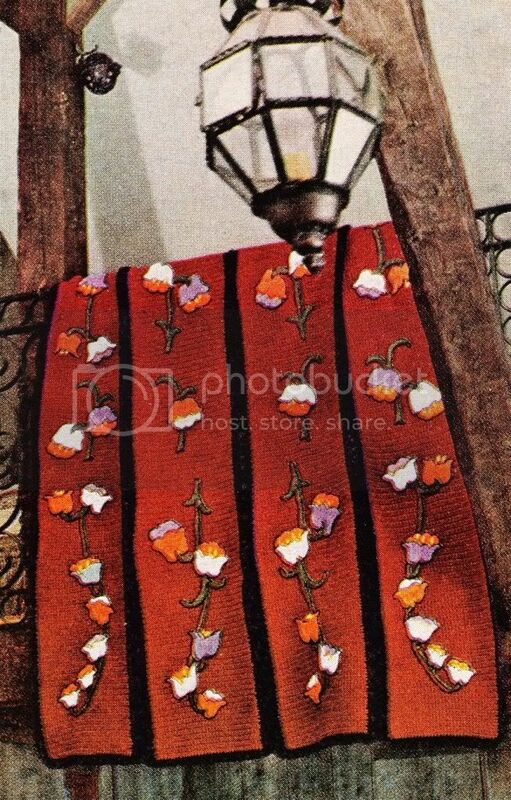 The sleeves, worked separately, are then joined to complete the yoke. Coats & Clark's Knitting Worsted. Stripes and patches pattern a wrap skirt that may be made in any length, any width. "Patched" strips are knit, then joined with bright crochet. Coats & Clark's Knitting Worsted. At-home warmth is reflected in an elongated knit that will go anywhere. Same motif, worked in different colors, gives a multipattern effect. Drawstring waist lets you nip it in as much as you like. Of Bucilla Superwash Knitting Worsted. A long, long column of single crochet-the perfect field for the blossoming of super-sized flowers! Quick to work up, dress has a back zipper for a trim fit. Simple-stitch embroidery is done in the same yarn. Bernat Knitting Worsted. Curl up under a shower of flowers! Giant blooms splash over a four-paneled afghan that is easy-and quick-to make. Each panel is worked in single crochet; then all are joined with a crocheted fagoting stitch. Of Bernat Knitting Worsted. Two little maids in a row wear pinafores that are just as pretty coming or going! Flower sprays-each slightly different-continue around the back of each for a posied hemline. Work both the same in single crochet with a picot edging; then embroider the flowers she likes the best. Of ColumbiaMinerva Knitting Worsted. LOL! That vine dress is a kill! 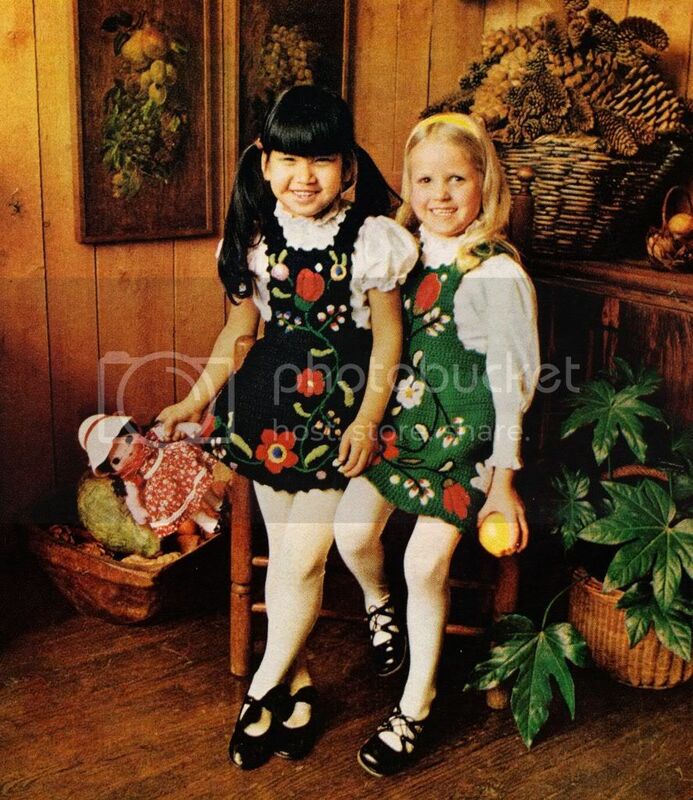 But I could really go for those little girl dresses... How cute! 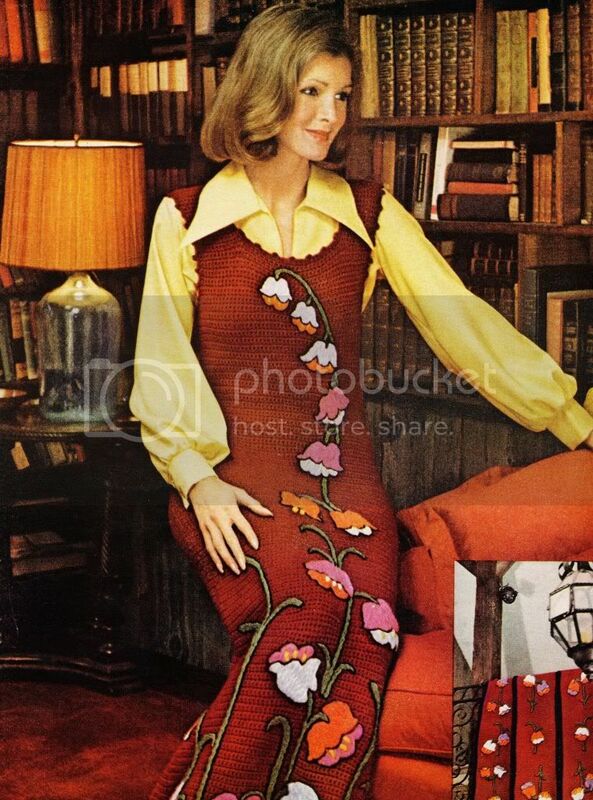 I'm curiously attracted to "Yoked pullover, a mosaic delight" and those pinafores are darling! If my mother could crochet, I'm sure I would have been wearing one of those at that age. Wow! those are something else. I actually do really like the little girls' dresses though.... would make a fab (somewhat mad) skirt ! These are not the Barbies you are looking for. Build Your Own Best Silhouette 1956 Underwear!